July 2002–For those who take the back roads into the county, the rolling orchards of the Stanek Farm along County Road 633 have long been the place where one senses a change. The last remnants of the city fall away, and, like plunging into an oasis of green, the pastoral quality of Leelanau begins. 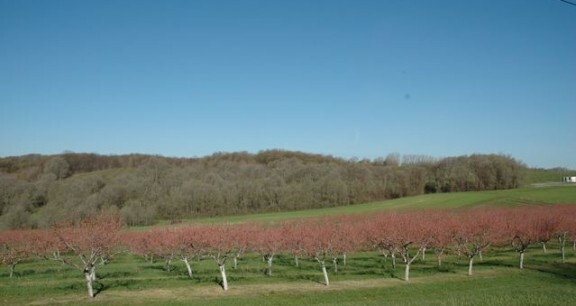 Snaking up the road toward Crain Hill, the healthy, bushy-green apple and cherry trees that dip and rise in tidy rows on some of Leelanau’s most productive agricultural land line the highway like sentinels. The trees seem to go on for miles, and, in fact, they do. To know that this drive and this land will stay essentially the same forever through a pending purchase of development rights is the biggest news yet on Leelanau’s fledgling farmland preservation front. In mid-June, the Stanek family, the State of Michigan and the Leelanau Conservancy came to an agreement that will ultimately preserve 320 acres of the Staneks 600-plus-acre holdings. For brothers John and Jerry Stanek, fourth-generation farmers, the move was strictly a good business decision, says Jerry. “We had been exploring for about five years the different things we could do to generate cash flow for the farming operation,” says Jerry, who began talking with the Conservancy two years ago. With a glut of cherries and the bottom falling out of the apple market, business had gotten tougher and tougher. This year’s freezing spring temperatures have destroyed the 2002 cherry crop, but the Staneks still have to prune trees, spray and buy fertilizer. There’s a name for years like this one. “It’s called a wipe-out,” says Jerry’s 83-year-old father, Gerald, whose great-great-grandfather settled this land back in 1883. After many discussions, the brothers decided a sale of development rights was the way to go. They still own their land, and can even resell it to another farmer, but will also be paid right now to agree not to develop it (the difference between what the land is worth as agricultural land versus residential land). Meanwhile, they’ve kept their options open on their remaining acreage, which will likely increase in value when it abuts the preserved land. And, says Jerry, the acreage will stay in farming. “Whether it’s apples or cherries or grapes or some new plant that cures cancer, this land will be available to grow it,” he adds. In the deal, the Conservancy will buy 90 acres outright along CR 633 at Crain Hill Road. The Conservancy plans to find a conservation-minded buyer for the 90 acres who will accept restrictions prohibiting more than two home-sites on the land, preserving over 80 acres of this land that John and Jerry’s ancestors homesteaded. Just north of the Conservancy’s purchase is an additional 230 acres of orchard land that will be protected through a sale of development rights (PDR) by the Staneks to the State of Michigan. The Conservancy helped the Staneks through the state’s application process and also provided 50% of the funds necessary to secure the deal. 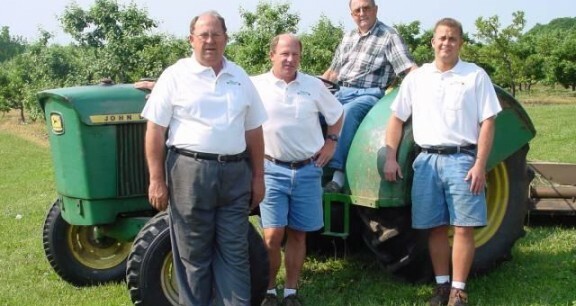 L to r: Brothers John and Jerry Stanek, their father Gerald Stanek and John’s son John.